BATES COUNTY, Mo. — The Humane Society of Missouri Animal Cruelty Task Force rescued 84 dogs and 17 cats Wednesday night from a property in Bates County, Missouri. “These animals were forced to live in truly squalid conditions, the worst I have encountered in more than 40 years of rescuing animals from abuse and neglect,” said Debbie Hill, HSMO’s vice president of operations. According to the Humane Society of Missouri, the majority of the animals were living inside "a waste-filled, trash-strewn, dilapidated small house." 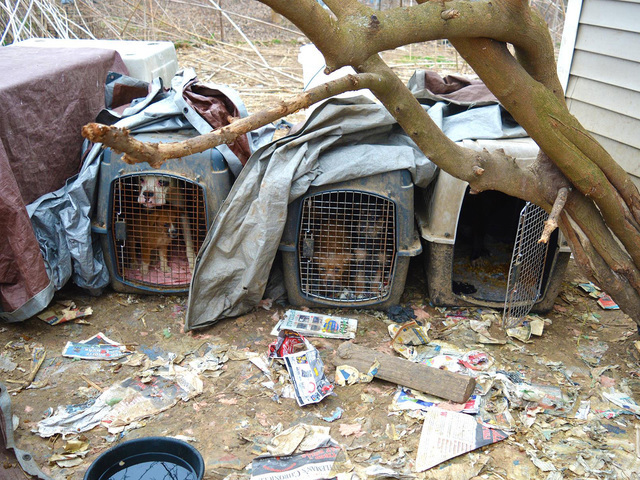 Many were in crates with so many layers of feces and urine-saturated newspaper the animals had no room to stand. The society said there is no running water on the property, and a majority of the animals didn't have access to water. Someone who was concerned about the animals contacted the Humane Society of Missouri and the Bates County Sheriff’s Office about the animals’ living conditions. A news release from the Humane Society of Missouri said both agencies visited the property but were only allowed to see a few of the animals and didn't see where the animals were living. They gave the owner recommendations for how to care for the animals. The Humane Society of Missouri said conditions didn't improve, and a warrant was obtained to inspect the property and remove animals as necessary. The Bates County Sheriff’s Office asked for the society to help remove, transport and shelter the animals. A disposition hearing to determine permanent custody of the animals was scheduled for January 2 at the Bates County Court House. This wasn't the Humane Society of Missouri’s first time at the property. In 2011, the society rescued more than 50 dogs from the same property under a warrant obtained by the Bates County Sheriff’s Office. The news release said the dogs would be taken to the Humane Society of Missouri headquarters in St. Louis. They’ll be examined by the society’s shelter veterinary team and made available for adoption as soon as possible.